Particularly in the last decades the awareness of companies themselves and the public for good corporate governance increased dramatically. „Corporate governance is set to be the primary focus for the 21st“ century. Most of the advanced economies have released new corporate governance rules and codes or company laws, especially as a result of the financial crisis in 2007 and the breakdown of several big companies worldwide. In Australia attention to corporate governance has grown after the „major corporate collapses and scandals of 2001 and 2002“, which included „five publicly traded (…) companies (...) [such as the] telecom company (One.Tel)“. In the first part, this paper will provide you with background information on the terms corporate governance and corporate control. 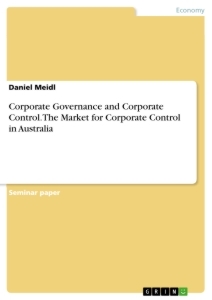 The second part outlines corporate control in Australia by elaborating on the market for corporate control, monitoring by shareholders, monitoring by non-executives and renumeration. The following paragraph provides general definitions of the terms corporate governance and corporate control. Besides, it informs about the main purposes of corporate governance and corporate control. To sum it up, corporate governance is a system which tries to balance the interests of the management, which runs the company, and the investors such as shareholders. Good corporate governance is an indicator of high confidence of the investors in the management. “Corporate Governance is the system by which business corporations are directed and controlled.” Therefore corporate control is just one aspect of corporate governance. Corporate control can be explained as the process of controlling as well as monitoring activities within a company. Corporate control mechanisms are designed to ensure that planned objectives are reached. Furthermore it reduces and corrects any arising deflections and inefficiencies as a result of the agency problem. Especially in companies with a separation of ownership control, the agency problem is a widespread phenomena and corporate control mechanisms are needed. In such companies the management as the agent and the shareholders as the principal follow different objectives and additionally there does exist an information asymmetry between the principal and the agent. The information asymmetry results in agency costs, which are defined as the costs that arise in the management and shareholder relationship. Shareholders as an example, usually want to maximize the return on their investment, whereas the management makes decisions to increase their performance-based income. To reduce the agency problem and to increase the control within a company, a company can make use of corporate control mechanisms. This paper mainly focuses on the following external and internal monitoring systems: Market for corporate control, the monitoring by shareholders, the monitoring by non-executive directors and renumeration. As noted in the previous section, the main purpose of corporate control is to ensure that company’s goals are met by “monitoring [the overall] performance.“ This can be done by “the threat of hostile takeover (,which is known as the market for corporate control,)” as an external monitoring system and by the monitoring by shareholders or by non-executive directors and renumeration as internal monitoring systems. In the following part of this work, the monitoring systems will be taken as an example to provide you with information on corporate control in Australia. The market for corporate control refers to a market where underperforming companies are attractive to hostile raiders. The underperformance might be a result of poor corporate governance. Thus it is an incentive for the management to run the company in the interest of the stakeholders and therefore optimally, because in case of a hostile takeover the risk of the management being replaced due to their poor performance is quite high. Accordingly the management style as well as the behavior of the management is controlled by the market for corporate control, which in this case is an external monitoring system. In Australia the market for corporate control is “reasonably efficient”. The more efficient a market for corporate control is, the higher is the risk of hostile takeovers for a company, which are not operated efficiently by the responsible management. From 1992 to 2001 there were 401 completed merger and acquisitions in Australia. In 2007 the number of mergers and acquisitions had is all time high with more than 350. 75 of the 401 transactions between 1992 and 2001 were hostile takeovers. In comparison to other developed economies this number is an indicator for Australia being an efficient market for corporate control. As the risk for hostile takeovers is high in Australia, the management of Australian companies has to focus on running the company efficiently and in the interest of stakeholders such as shareholders. Shareholders, in particular large shareholders, have the incentives to monitor the management and to reduce agency costs. The market in Australia is characterized by a high level of blockholders. Blockholders are characterized by a owning a large amount of stocks. Blockholders are interested in monitoring the management, because by monitoring the management they can ensure that the management increases the value of the company, which in turn leads to a higher value for the shareholders. The benefits brought by the monitoring of the blockholders can be split up into shared and private benefits. Shared benefits are “enjoyed as much by the minority shareholders as by the blockholders.” Those benefits include amongst others the improved information flow by the company to all shareholders. As mentioned before Australia has a large number of blockholders in comparison to other developed countries. According to a study conducted by Lamba and Stapledon (2001) about the ownership structure in 240 listed Australian companies, around 72.1 percent of the companies had a blockholder with at least a 10 percent stake in the company. The influence of institutional investors in the controlling of the management and therefore the reduction of agency costs have increased steadily in Australia. This is mainly because of the emergence of proxy advisers since 2005. In addition the percentage of institutional shareholders grew from around 50 percent in the 1990s to 64 percent in 2009. Institutional shareholders started to develop guidelines on how to compose the board, on the renumeration for the executives and they even intervened in case of underperformance. As mentioned above, the increased number of proxy advisers played an important role in the transformation of the institutional shareholders towards being more influential. A proxy advisor is a firm, which provides services in the form of guidance, analysis and recommendations to mostly institutional shareholders. With the expert knowledge of the proxy advisers on amongst others the renumeration practices, “they have stimulated the an increased level of dialogue between companies and their institutional shareholders on pay issues and drawn attention on questionable renumeration”. Furthermore proxy advisors impacted the election of directors, which has once been a routine event. In summary institutional shareholders in cooperation with their proxy advisers have a great impact on the monitoring of the management. In Australia as well as in most other developed countries the controlling of the management performance by independent non-executive directors is a widely used system of corporate control. According to a study by the Australian Council of Superannuation Investors, 80 percent of non-executive directors were assessed independent. There have been a few studies on the relationship between the number of independent non-executive directors and the company performance, but none of the studies have shown any relationship. Tricker, B. (2012): Corporate Governance Principles, Policies, and Practices, Oxford, p.3. Tricker, B. (2012): Corporate Governance Principles, Policies, and Practices, Oxford, p.3ff. Mallin, C. A. (2011): Handbook on International Corporate Governance: Country Analyses, Cheltenham, p.330. Owen, J. (2003): The Failure of HIH Insurance Volume 1: A Corporate Collapse and Its Lessons, Australia, p.xxxiv. Cf. Davies, A. (2011): The Globalisation of Corporate Governance: The Challenge of Clashing Cultures, Farnham, p.4. Davies, A. (2011): The Globalisation of Corporate Governance: The Challenge of Clashing Cultures, Farnham, p.4. Douma, S. and Schreuder, H. (2013): Economic Approaches to Organisations, London, p.364. Cf. Farrar, J. (2001): Corporate Governance in Australia and New Zealand, Oxford, p.392. Cf. Douma, S. and Schreuder, H. (2013): Economic Approaches to Organisations, London, p.366ff. Mallin, Christine A. (2011): Handbook on International Corporate Governance: Country Analyses, Cheltenham, p.331. Cf. Teall, J. T. (2007): Governance and the Market for Corporate Control, New York, p.4ff. Cf. Dignam, A. (2005): The Takeovers Panel, the Market Efficiency Principle and the Market for Corporate Control – An Empirical Study, Oxford, p.58ff. Cf. Mallin, Christine A. (2011): Handbook on International Corporate Governance: Country Analyses, Cheltenham, p.331. Cf. Shleifer, A. and Vishny, R. (1986): Large shareholders and corporate control, Chicago, p.461ff. Mallin, Christine A. (2011): Handbook on International Corporate Governance: Country Analyses, Cheltenham, p.334. Cf. Stein, J. (1989): Efficient capital markets, inefficient firms of myopic corporate behaviour, Oxford, p.655ff. Mallin, Christine A. (2011): Handbook on International Corporate Governance: Country Analyses, Cheltenham, p.335. Cf. Mallin, Christine A. (2011): Handbook on International Corporate Governance: Country Analyses, Cheltenham, p.340. ACSI (2009): ACSI Governance Guideline, Melbourne.